Mr Vegan's Neighborhood: It Aint Easy Being Green During The Holidays, That's Why God Created Mole! It Aint Easy Being Green During The Holidays, That's Why God Created Mole! All but one of the products gave good results. The corn tortillas were smaller than I was expecting, but were nice and soft when warmed and had really good texture and flavour. The tin of pickled jalapenos was really interesting. Not only were they much hotter than I was expecting but contained pieces of pickled carrots and onions too. The black beans were very welcome as they are a particular favourite of mine. Drained a 560g tin of black beans (in salted water) into a bowl. Added 4 cloves of finely chopped garlic. Squeezed in the juice of 1 lime. Mixed and left to marinade. Chopped one small onion and fried in a tbsp of sunflower oil for a couple of minutes on moderate heat. Chopped 1 large orange pepper and added to the onion, turning down the heat a little. Fried for a further 5 minutes. Added 2 tbsp frozen sweetcorn and fried for a further two minutes. Added ½ red chilli - seeds removed and finely chopped. Added 2 large jalapeno chillies - sliced. 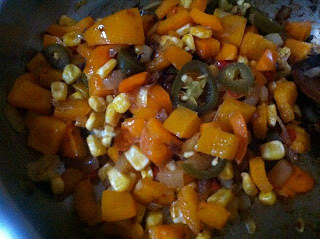 Added ½ teaspoon ground cumin. Mixed it in and fried for a further two minutes. Turned off the heat. Emptied a 235g jar chocolate mole into a large ovenproof dish. This was meant to be poured in with some being kept back to pour over the top, but it was way too thick to be able to do this and I was hoping it would soften in the oven and become more sauce like). Heated a frying pan and added a tsp of sunflower oil. Warmed the tortillas to soften them, one by one in the pan over low heat for a couple of minutes. 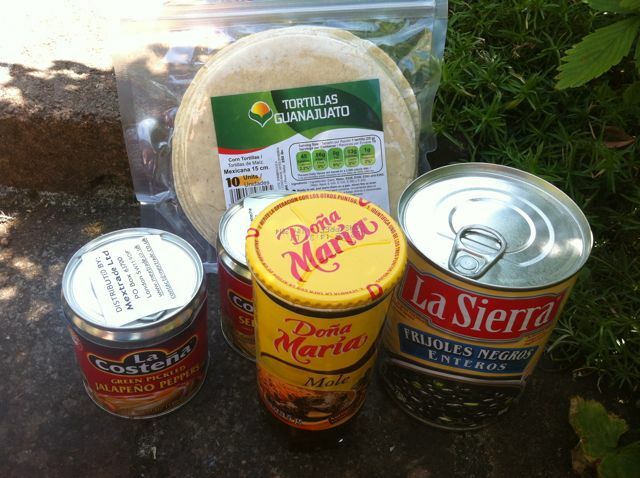 Placed a spoonful of the bean mixture onto the middle of each tortilla followed by a spoonful of the pepper mixture. Folded the ends in to form a roll and placed in the dish on top of the mole, packing them all in tightly. Covered the top with 4 oz cheddar cheese and baked in the oven at 180°C for 25 minutes. Scattered some chopped parsley over the top and served. Ay ay ay! The chocolate mole sauce was really unpleasant with a horrible bitter, burnt caramel taste. It was also virtually solid, so impossible to pour and difficult to use. I don't know if there was something wrong with this particular jar or if that is how it is meant to be - seems unlikely. In order to rescue the meal, we had to scrape it off the enchiladas. 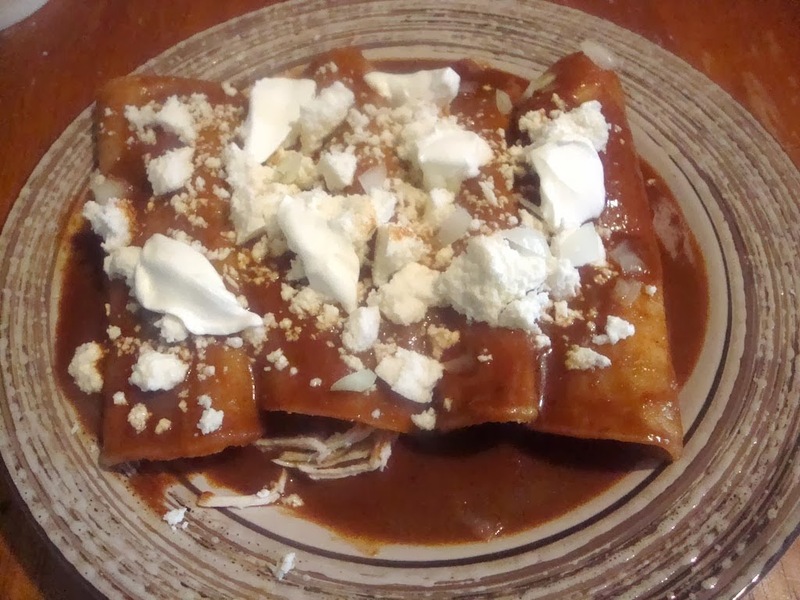 The enchiladas sin mole were delicious and had the sauce been a nice one, they would have been even better. 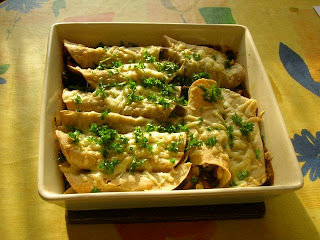 I will be making this recipe again as it is a good one; all I need to do next time is make my own mole! That recipe coming up next, as well as some other fun veggie Mexican dishes to try this holiday season!